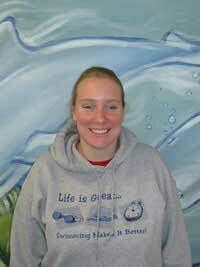 Caitlin began working at SwimWest in September 1999 as an instructor and lifeguard. She attended the University of Wisconsin at LaCrosse and earned a degree in Recreation Management. In May, 2006 Caitlin was promoted to Aquatic Director for the new Fitchburg location and has helped that location thrive ever since. She lives in Madison with her husband, Blair, and in her spare time loves to go out with friends, spend time with her extended family, and shop at Target! Caitlin is a Certified Pool Operator, is certified by the American Red Cross in Lifeguarding, Lifeguard Instruction, and CPR/First Aid, and is WSI certified.